Exploration, Excitement, Experiences. They are what the PADI Advanced Open Water Diver course is all about. 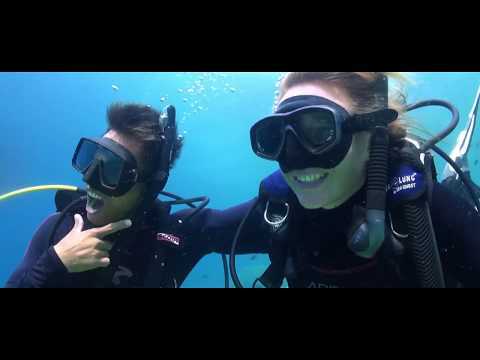 The course is designed so you can go straight into it after the PADI Open Water Diver course. The Advanced Open Water Course will help develop your already learnt skills, including teaching you a few new ones. It will help give you the confidence and independence in you future diving. Plan, conduct and log open water no stop (no decompression) dives when properly equipped and when accompanied by a buddy in conditions with which they have training and/or experience. One reason you'll love the Advanced Open Water Diver course is that you and your instructor choose from 15 types of Adventure Dives to complete your course. You can try your hand at Digital Underwater Photography, Wreck Diving, Night Diving, Search, and Recovery, even learn about marine life and much, much more. The course allows being bent around you, so that you learn, what you want to learn! So Just go and have fun! You use all the basic scuba gear including your underwater compass. Depending on which three adventure dives you pick, you may also be introduced to underwater photography equipment, a dive light, lift bags, a dive flag/float or other speciality gear. PADI's Adventures in Diving Manual and DVD provide information on more than 15 types of speciality diving.You'll use them as a guidebook to improve your diving skills and prepare for new experiences and adventures. After you've tried a speciality in the Advanced Open Water Diver course, you'll probably want to take the Speciality Course and learn more! Just because you learnt some of the specialities does not mean you can't go any further, if there was anything else you wanted to learn but were not able to, you can still go give it a go! See also the PADI Rescue Diver!